Just when Chicago’s fiscal problems looked they couldn’t get much worse, a new study shows that the city now faces nearly $23 billion in unfunded pension liabilities, the Chicago Tribune reports.Chicago’s unfunded pension obligation has increased 600% since 2000, according to the report, released by the city’s Civic Federation. When combined with state pension debt, unfunded liabilities on public employee pensions would now cost each Chicago resident more than $11,934. Much of the blame rests with Illinois’ pension code, which allows local governments to avoid paying their contributions to public employee pension plans. This problem is exacerbated, the report says, as the number of retirees exceeds the number of active public employees. The study comes as Chicago’s mayoral candidates attempt to articulate their strategies to deal with a projected budget shortfall of about $600 million before next week’s election. 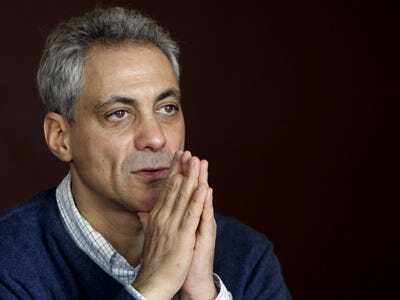 The Civic Federation recommends that the next mayor – likely to be Rahm Emanuel – develop a long-term financial plan that includes the creation of a separate retiree health care trust fund. So far, though, Rahm has been mum on how he would deal with Chicago’s burgeoning pension crisis.